Vancouver B.C. restaurants! Granville Island! Your favorites? I’m crazy for Vancouver, and each time I go I ask myself, “Why don’t you come here more often?” If you haven’t been, what are you waiting for? Yeah, yeah, I know: you’re waiting for the Winter Olympics to blow over, and who can blame you? It won’t be easy getting a reservation to eat — or sleep — in Vancouver in the near future (let alone get a ticket to one of the big events), but unlike the folks converging on the city right now, we’ve got plenty of time to head north, as I mentioned in my food-focused story in Sunday’s travel section. 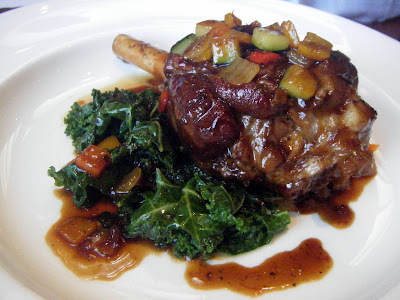 But whenever you do get there, trust me: if you like to eat, it’ll be well worth it. 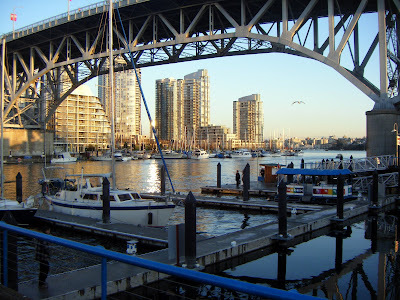 The view from Vancouver’s Granville Island. Heaven — on a plate — awaits. 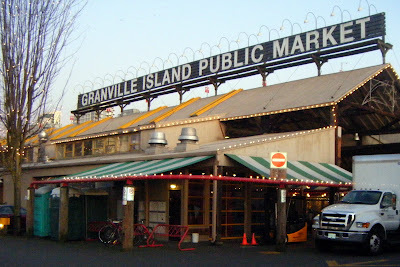 In addition to hitting a lot of restaurants during my December stay, I spent an afternoon tooling around the Granville Island Public Market, home to Vancouver’s version of Pike Place Market. 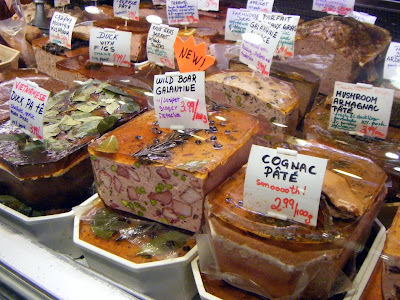 And as much as I cherish our major tourist attraction and everything it offers, the stunning foodstuffs available at their Public Market made me weep. Why? Well, let me show you. You’re right. It doesn’t look too exciting — from the outside. 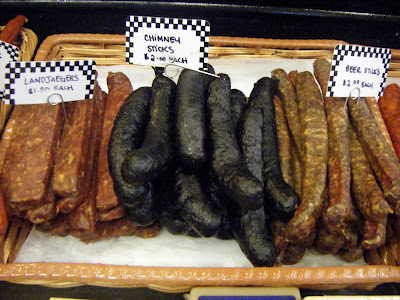 Pates galore, at Oyama Sausage Company. 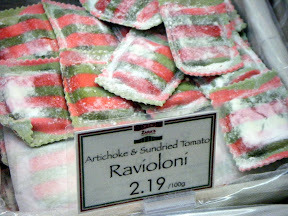 Handmade pasta at Zara’s Italian Deli. Move over Bavarian Meats! Check out these goodies from Dussa’s Ham & Cheese. 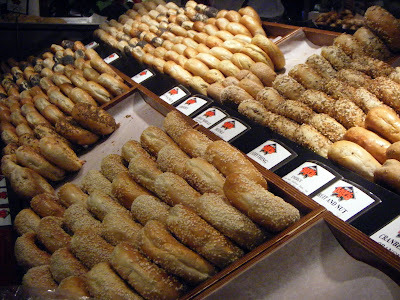 Siegel’s Bagels! Oy, like Montreal yet. Get me a knife and some schmear already! 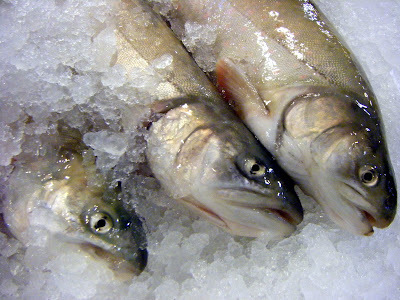 Arctic char: I only have eyes, for youuuuuu,dearrrrrrr! 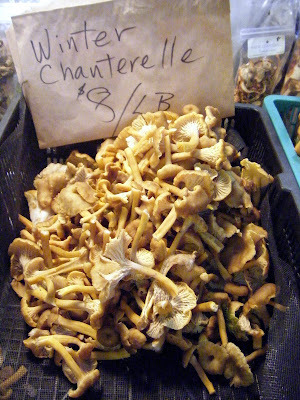 Winter Chanterelles, sold at one of the market’s day stalls. 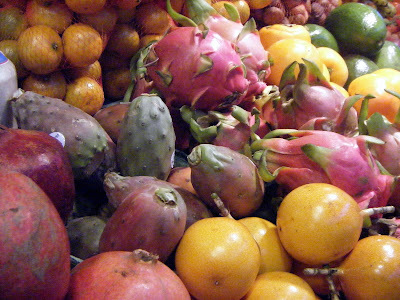 Exotic fruits? You want it, they’ve got it. 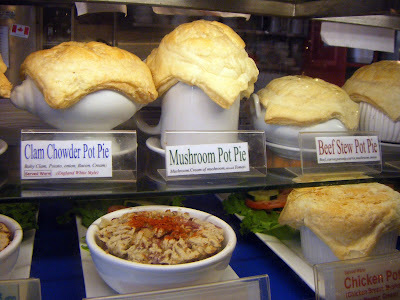 I’m still sorry I didn’t try one of these pot pies from the A La Mode stand. 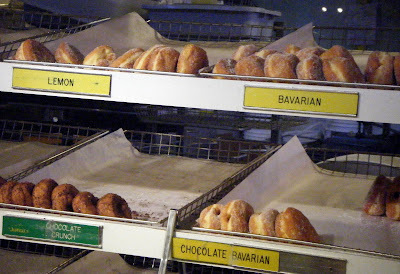 And I’m doubly sorry I only had one Bavarian cream doughnut from Lee’s Donuts, because it tasted exactly like the ones I adored when I was a kid: with real Bavarian cream. 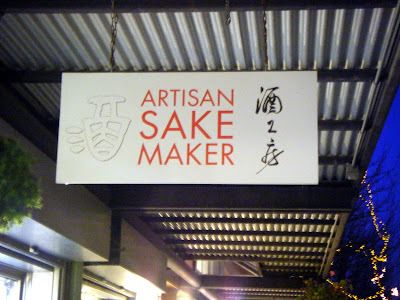 But the best find of all wasn’t in the Public Market, it was in a little shop along Granville Island’s Railspur Alley: Artisan Sake Maker. If you love sake as much as I do, you need to keep an eye open for this sign. 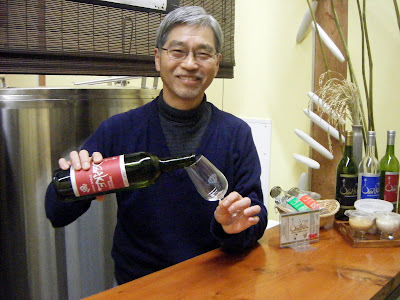 “Try before you buy!” urges sakemaster Masa Shiroki, who, unlike most North American sakemakers, uses Japanese junmai rice to make his seasonal sakes, right here in his Granville Island brewery and tasting-room, set for expansion this spring. B.C. 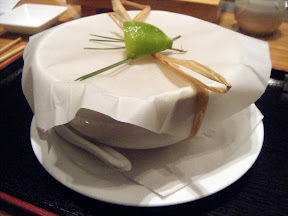 sablefish, gift-wrapped. Unveiled, a smoky aroma perfumes the air. 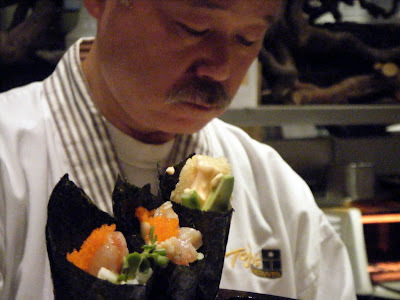 Hidekazu Tojo at the sushi bar, where it’s omakase-only. 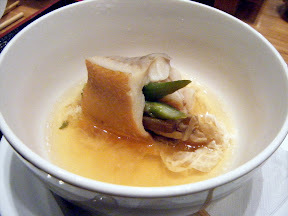 Of course, not everyone wants to shell out over $100 a head for Japanese food. Sometimes you just want to mow, blow and go. And that’s where Japadog comes in. I found the place parked on the corner of Burrard and Smithe streets — right across the street from Le Crocodile (a longtime favorite of mine, where French food gets the classic treatment). At Japadog, there’s often a line-up for Japanese-accented tubesteaks sold from a mobile cart. I knocked back one of the best-selling dogs, the Kurobuta Terimayo ($6.75). Made with a hot link of Berkshire pork, it’s grilled to order, squiggled with teriyaki sauce and Japanese mayo, and showered with dried seaweed. And if you think that sounds strange, clearly you’ve never eaten a Chicago Red Hot (sport peppers? 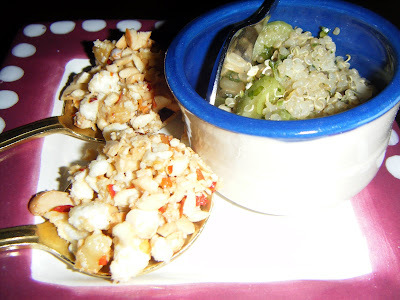 celery salt?). I’m thrilled to say I finally got my chance to dine at Vij’s, where people also line up to get a taste of something different: contemporary Indian food. The line outside Vij’s at 5 p.m. on a Friday in early December. Sorry, gang. No reservations! 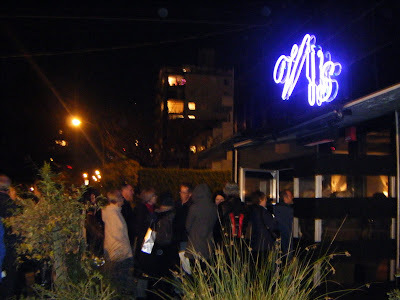 I’d been hearing about Vij’s for years, and was perfectly happy to stand out in the cold for a half-hour schmoozing with strangers before the doors opened, seeing as the food (and the service) lived up to its reputation. Vikram Vij calls this a “Punjabi Heart Attack.” I call it a swoon on a spoon. From left: Jackfruit curry; Rajasthani-style goat curry; prawns and halibut in coconut-lemon curry. There are those who say Vij’s is the best Indian food in the Pacific Northwest, and I think they’re right. But of all the meals I ate in Vancouver — including takeout from Minerva’s Mediterranean Deli (a charming, well-stocked Greek deli and cafe in Kitsilano) and breakfast that blew me away at Cafe Medina (served in a cast iron skillet, just like this, in the photo below). 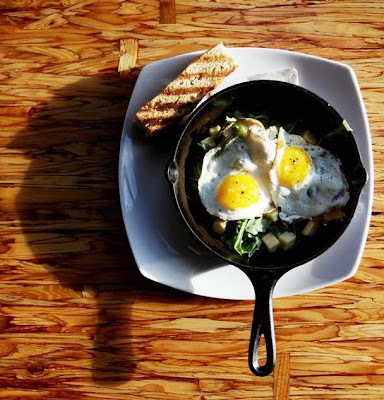 At Cafe Medina, fried eggs top a fricasse of braised short ribs, caramelized onions, arugula and applewood cheddar. That said, the most memorable meal on this Vancouver visit was lunch at West, where they keep copies of chef-exec Warren Geraghty’s photo-heavy cookbook on the bar, though the food’s every bit as gorgeous for real. If a picture paints a thousand words, as they say (whoever “they” are), here’s a portrait of my lunch at West, which says it all, beginning with a cocktail and ending with dessert. Yes, it looks like iced tea. Nope. 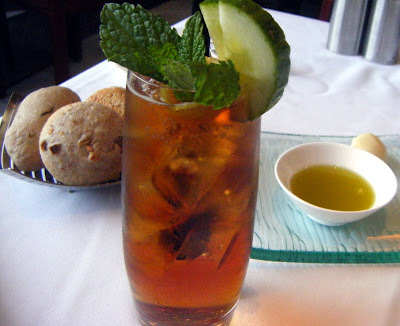 It’s a refreshing Pimm’s Cup. 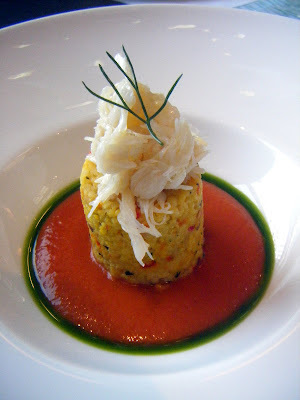 Dungeness crab and saffron couscous with smoked tomato gazpacho (this is a half portion: they were kind enough to split this first course for me and my pal Abbie). 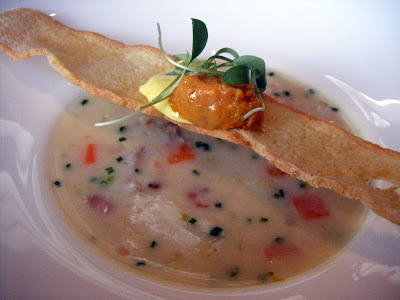 Man, this was one delicate seafood chowder. Check out the uni add-on! B.C. 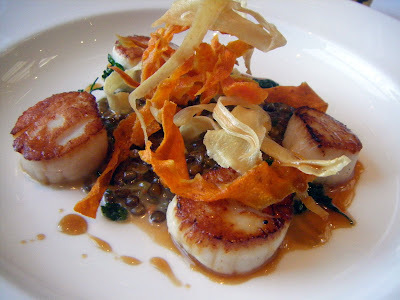 scallops over buttered lentils with a frizzle of fried root vegetables. Shanks for the memories, West! 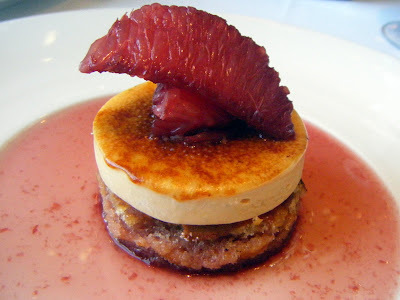 Frozen creme brulee, with port-soaked grapefruit. 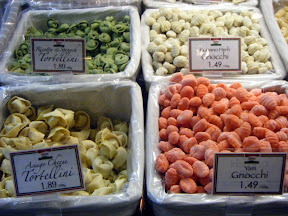 So, now that I’ve offered my show-and-tell, do tell: When you travel to Vancouver, where do you eat? And while we’re on the subject, feel free to digress and add your two-cents-worth regarding Chinese food in Richmond, where I won’t soon forget the dim sum I ate at Shiang Garden. A repeat of that meal alone is worth a trip north again — and soon.